This week I have attempted to demonstrate how unsafe arterial roads are for pedestrians in the City of Rockford. Improving mobility outcomes will never come through slinging mud at municipal officials. So I’ve met with Mayor McNamara to present my findings and discuss the administrative implications from the research. My emphasis in this series has been on reducing vehicle speed, as I believe that is the most significant variable at play. Speed increases risk, reduces recognition, and extends the stop distance of vehicles. Reducing speed gives pedestrians a fighting chance in the event of a collision. Additionally, I hope that the construction basic pedestrian infrastructure is one of the fruits of this research. There are several portions of State, for example that have both sustained a higher proportion of pedestrian collisions while lacking sidewalks, bus platforms, etc. You can imagine how difficult this gets for people who walk in the winter. I’m also in the process of meeting with a select council members to discuss the findings. In particular, I plan on meeting with Alderman Tuneberg, Logemann and Beach. Together, 53% of all collisions happen in these wards. My next steps are not fully materialized yet, but it involves focusing on a section of 11th street, gathering data on pedestrian and motorist behavior, and preparing a municipal plan for addressing this issue. Although is my final project for graduate school, I hope that the recommendations will be considered by city officials. Have a roadway improvement in your neighborhood? If you’re like Rockford and have a Complete Streets policy in the books, then that policy probably has some performance measures to ascertain success. For example: Linear feet of sidewalk or bike lanes, or rate of children walking to school. Ask your council member: How is our ward contributing towards that end? Long before the dump trucks arrive, you should really get familiar with your community’s Capital Improvement Plan. Unlike super-amazing places like Seville, most active transportation improvements take a long time. Look ahead, see what the city has planned for the next five years, and make sure your council member knows that you support safe roadways that slow vehicle speeds and improve pedestrian mobility. This example is from the twin cities, courtesy of Bill Lindeke. Every time you see one of these signs–“Sidewalk Closed”–ask yourself, “What’s the Plan B?” If the sidewalk is closed for a construction project, the city is required to provide an alternative. Here’s one example from the Twin Cities for context. Given our incomplete sidewalk network, I think it’s important that we fight to keep what we have connected. A final thing to do: Be careful. 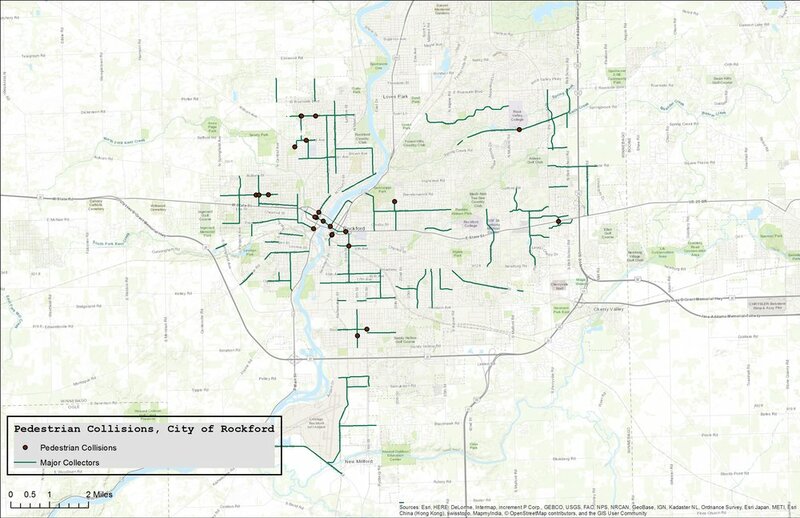 For those who walk in Rockford: I hope this research shows you the roads that are most unsafe to walk near. For those who drive in Rockford: Be mindful that there are other people that cannot or choose not to use a motor vehicle for their mobility needs. I’ll close with this newspaper excerpt that I shared in the first post. Pedestrian collisions have been around long before Motordom appeared. Seeing the transition and effects of roads to stroads in excerpts like this, however, show me that we have a long road ahead. I earnestly hope the next forty years are better for non-motorized users of our transportation network. How can we work together to maximize safety and accessibility for non-motorized users of our transportation network? 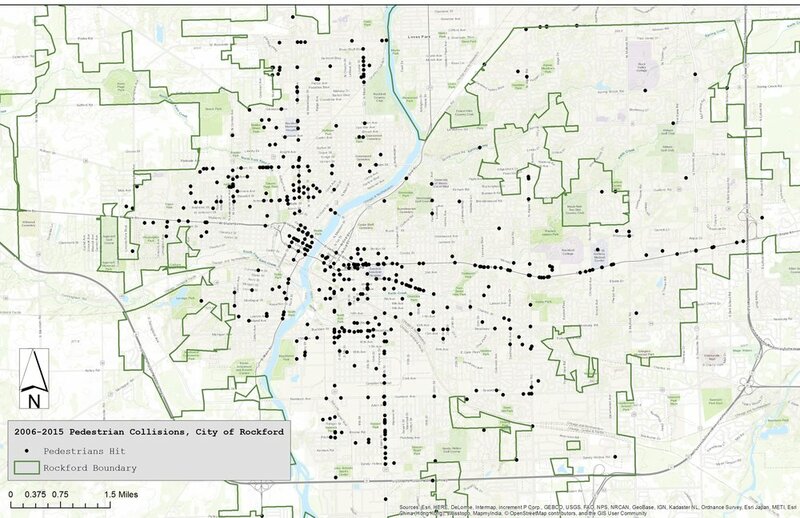 From 2006-2015, 551 pedestrians were hit by the driver of a vehicle in the City of Rockford. Of the 551 collisions, 23 were fatal. (note: It is likely that these fatalities occurred at the scene. It is unlikely that IDOT has obtained data from area hospitals, so the number of fatalities may be higher). I explored the attribute tables afterwards. I found that 56% of collisions happened in the daytime, not at nighttime (when people are often blamed for not wearing reflective, bright-colored clothing). I also found that inclement weather–snow, rain, fog, wind combined–was present in only 18% of the collisions. I then overlaid zoning districts onto the collisions. Pictured here is our C-4, mixed-use district, the most compact, walkable space we have in Rockford. City Market, Friday Night Flix, Stroll on State…we have a lot of people out walking downtown. Surely most of our collisions are happening in this district? While not insignificant, only 15% of all pedestrian collisions occurred here. Pictured here are a couple of our commercial districts. This is where most folks are getting their groceries, cashing their checks, or dining out. 33% of all pedestrian collisions occurred here. So what about these districts? More particularly, what does the type of roadway bisecting these zones tell us about pedestrian collisions? Pedestrian collisions occur more frequently on principal arterial roads in the City of Rockford. Less than 1% of all pedestrian collisions occurred on minor collectors. Just over 1% of all pedestrian collisions occurred on major collectors. 9% of all pedestrian collisions occurred on minor arterials. Notably, Auburn and Broadway have a significant collection of collisions. 81% of all pedestrian collisions occurred on principal arterials. We can accept the above hypothesis. State Street: 23% of all collisions (126 of 551) occur on State Street, which is owned by IDOT. 11th: 9% of all collisions (46 of 551) happen here. The highest concentration of collisions are on the portion of 11th that is also owned by IDOT. Charles: 8% of all collisions (39 of 551) happen here. As you can see, these streets do a great job at moving a large number of vehicles every day. However, they do a poor job at moving pedestrians. Tomorrow I will look at some of the design characteristics typifying arterial roads that frustrate pedestrian mobility and compromise pedestrian safety. If you were to close your eyes and place a finger on any transportation-related document your city is producing, there’s a good chance you’d land on one word: Safety. Excerpt of our Complete Streets policy. Excerpt of our LimeBike agreement. These excerpts are from recent resolutions and agreements that the Rockford City Council has adopted. All the right words are here: “multimodal”, “all ages and abilities”, “safe routes to school”, even “maximize carbon-free mobility”. All good. Every so often I would hear of pedestrians getting hit by drivers on certain roads. So I began to research our library’s newspaper archive. Turns out we’ve had a problem with pedestrian collisions for some time. The above example in particular is telling: Once a “comfortable country road”, Alpine Road has now sustained two pedestrian collisions in the last month…January 1974. Over forty years ago. Alpine, looking north, just north of Alpine/State intersection. Image courtesy of Bob Anderson. Alpine today. Image courtesy of Google. This is a four-part series on the history of traffic safety reforms in the United States. Part one is here, part two is here, and part three is here. Norton’s fourth paradigm, which covers the 1980s to the present day, bears similarities to the paradigms of the past. Although the automobile industry remains governed by safety mandates, this paradigm elevates more responsibility to drivers for the safety of those inside and outside of the vehicle. The ‘E’s of education and enforcement are instrumental towards this end. For example, organizations such as Mothers Against Drunk Driving (MADD) and increased law enforcement penalties responded to the acute problem of drunk driving, especially in the 1980s. Federal and state transportation departments have organized a number of awareness weeks ranging from work zone safety to distracted driving to “Start Seeing Motorcycles”. The notion that safety is a “shared responsibility” between motorists and pedestrians re-emerged, and various state and local campaigns have encouraged the latter to wear reflective clothing and refrain from texting while walking. An interesting feature of the responsibility paradigm is the deviation from the roadway as an automobile-exclusive utility and the willingness to reclaim the roadway for public spaces and other transportation modes. Eric Dunbaugh refers to these roadways as “livable streets” that respect the adjacent urban built environment and improve the quality of pedestrian walkways. This approach to street design arguably stands in contrast to the engineering efforts in previous paradigms that were chiefly concerned with moving automobile traffic, mitigating congestion, and eliminating road hazards. Indeed, the roadside design guides of the 1960s included such ‘forgiving design’ features as clear zones and removal of fixed hazardous objects such as trees within a certain buffer (Ibid, 287). Dunbaugh contends that the design cues of “livable streets” are no less safe than the forgiving design approach, with the former being more context-appropriate in urban areas. Roadway reclamation within this paradigm includes both benefits and challenges. 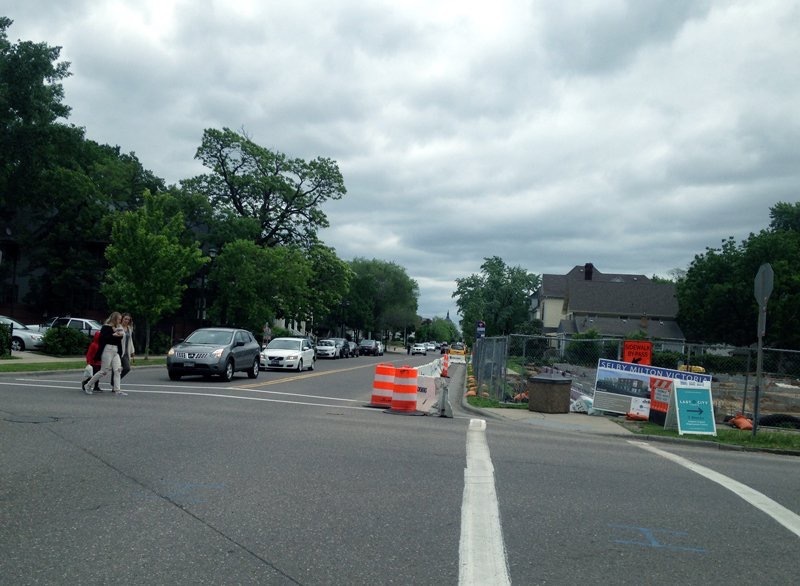 Brian Ladd highlights the traffic-calming benefits that exist within shared roadway space. John Pucher and Ralph Buehler mention that the most convenient bicycle facilities typically occupy space that was previously allocated exclusively to motor vehicles (2008, 512). Peter Muller accepts that the automobile will remain in urban settings, but states that coordination with other transportation modes is a more effective response than building additional freeways (2017, 83). Colin Divall’s idea of a “useable past” is especially salient for enriching the discussion around automated vehicles. The previous paradigms demonstrate how Americans have used technology to improve safety outcomes throughout most of the 20th century. During the “Safety First” paradigm motordom advocates argued that, in contrast to the horse and carriage, the handling and braking features of automobiles would actually improve traffic safety for pedestrians. During the 1939 World’s Fair, one of the vignettes of General Motors’ Futurama exhibit illustrated a remotely controlled driverless automobile with its passengers playing a board game. O’Connell and Myers summarize a 1960s conference that outlined approaches to electronically control vehicles ranging from notifications inside the vehicle to fully automated driving that removes the driver from his previous responsibilities. Underscoring this theme of automation is the shift from disciplining the driver to intelligently controlling the machine being driven. Although such a shift would resonate with crashworthiness advocates of the 1960s, critics such as the head of engineering mechanics for General Motors argued that electronic implements are more fallible than human drivers. Any meaningful discussion on using the past to inform an automated future should include the potential redistribution of the roles and responsibilities of multiple actors including the driver, the insurance company, and the automobile manufacturer with its attendant electronics and software companies. Ethical questions abound: Which actors are culpable in a traffic accident? How are ethical norms operationalized into computer algorithms? Can computers negotiate in-the-moment ‘trolley problems’ that result in less harmful and more moral outcomes than a human counterpart? Will intelligent control further reinforce the idea of a street as a unimodal utility at the expense of more vulnerable, less equal roadway users? The assemblage of power among automobile-oriented interests of previous paradigms suggests a useful precedent from which safety advocates in general and mode-specific interests in particular can learn. This series provided a brief history of traffic safety reforms in the United States. Using Norton’s four traffic safety paradigms as a framework for the series, I attempted to show how streets have and continue to be a contested space, not only with the advent of the “horseless carriage” but also with the imminence of automated vehicles. From municipal traffic engineers to the National Safety Council and to automotive companies, the trajectory of traffic safety reform in the 20th century shows multiple actors using rhetoric, power, and organization to legitimate a particular mode, namely motorized vehicles, to the street. The persistence of and continued interest in multimodal networks including bicycle, pedestrian, bus and light rail suggest that streets will continue to remain a contested space in the 21st century. Bernardin, S. (2015). Taking the Problem to the People: Traffic Safety from Public Relations to Political Theory, 1937-1954. Technology and Culture, Vol. 56, No. 2 (420-439). Blanke, D. (2007). Hell on Wheels: The Promise and Peril of America’s Car Culture, 1900-1940. University Press of Kansas. Brilliant, A. E. (1965). Some Aspects of Mass Motorization in Southern California, 1919-1929. Southern California Quarterly, Vol.47, No. 2 (191-208). Damon, N. (1958). The Action Program for Highway Safety. Annals of the American Academy of Political and Social Science, Vol. 320, No. 1 (15-26). Dunbaugh, E. (2005). Safe Streets, Livable Streets. Journal of the American Planning Association, Vol. 71, No. 3 (283-300). Esbester, M, and Wetmore, J.M. (2015). Introduction: Global Perspectives on Road Safety History. Technology and Culture, Vol. 56, No. 2 (307-318). Irwin, A. (1985). Risk and the Control of Technology: Public Policies for Road Traffic Safety in Britain and the United States. Dover, New Hampshire: Manchester University Press. Kelley, B. (2017). Public Health, Autonomous Automobiles, and the Rush to Market. Journal of Public Health Policy, Vol. 38, No. 2 (167-184). Kröger, F (2016). Automated Driving in Its Social, Historical and Cultural Contexts. In Maurer, M., Gerdes, J.C., Lenz, B., and Winner, H. J. Autonomous Driving: Technical, Legal, and Social Aspects (41-68). Springer Open. Ladd, Brian. “Autophobia: Love and Hate in the Automobile Age.” Chicago: University of Chicago Press, 2008. Martens, K. (2017). Transport Justice: Designing Fair Transportation Systems.” New York: Routledge. McShane, C. (1994). Down the Asphalt Path. New York: Columbia University Press. Möser, K. (2003). The Dark Side of ‘Automobilism’, 1900-1930: Violence, War, and the Motor Car. Journal of Transport History 3rd series, Vol. 24, No. 2 (238-258). Muller, P. O. (2017). Transportation in the Urban Form: Stages in the Spatial Evolution of the American Metropolis. In Giuliano, G., and Hanson, S. The Geography of Urban Transportation (57-84). Fourth edition. New York: The Guilford Press. Norton, P. (2007). Street Rivals: Jaywalking and the Invention of the Motor Age Street. Technology and Culture, Vol. 48, No.2 (331-359). Norton, P. (2015). Four Paradigms: Traffic Safety in the Twentieth-Century United States. Technology and Culture, Vol. 56, No 2 (319-334). Norton, P (2008). Fighting Traffic: The Dawn of the Motor Age in the American City. Cambridge, Massachusetts: The MIT Press. O’Connell, J., and Myers, A. (1966). Safety Last: An Indictment of the Auto Industry. New York: Random House. Packer, J. (2008). Mobility without Mayhem: Safety, Cars, and Citizenship. Durham, NC: Duke University Press. Pucher, J., and Buehler, R. Making Cycling Irresistible: Lessons from the Netherlands, Denmark and Germany. Transport Reviews Vol. 28, No. 4 (495-528). Wetmore, J. (2004). Redefining Risks and Redistributing Responsibilities: Building Networks to Increase Automobile Safety. Science, Technology, and Human Values, Vol. 29, No. 3 (377-405). This is a four-part series on the history of traffic safety reforms in the United States. Part one is here, and part two is here. Image courtesy of WNPR. Pictured in the foreground is a Chevrolet Corvair, a model that Nader mentioned was poorly designed and especially unsafe for occupants. This should not be interpreted as a laissez-faire response to vehicle fatalities but rather as a distinct shift of responsibility from the driver to vehicle, or more specifically the automotive manufacturer. If drivers would inevitably land on a spectrum between ineptitude and recklessness, then safety experts and advocates must work with automobile companies to reduce the effects of vehicular collisions and lower the risk of injury or death. Jameson Wetmore describes how safety-oriented researchers and doctors began using the term “second collision”–that between the vehicle’s occupants colliding with the vehicle’s interior–as way to discuss overall risk reduction. Structural reinforcements to the vehicle in addition to safety improvements within the vehicle’s interior would, according to safety advocates, decrease the intensity of occupant injury and likelihood of fatalities. In 1966 the National Highway Traffic Safety Administration was established. The previous claims of the automobile being “perfected by science and industry” were no longer valid, and laws followed that would mandate safety features within new automobiles. Notably, the total number of vehicle fatalities began decreasing into the 1970s and 1980s.